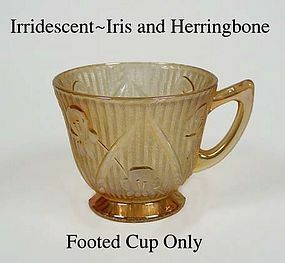 This footed Iris and Herringbone irridescent footed cup is in excellent condition. The color in the photo looks a little flat, but I can assure you they are the Marigold Color! 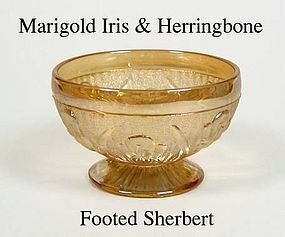 This Iris and Herringbone footed iridescent sherbert is in excellent condition! These items sold in even numbers only. Iris and Herringbone Short Ftd Sherbert-Hard To Find! 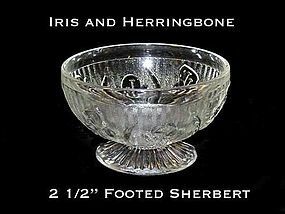 This short footed Iris and Herringbone sherbert was only made for a short time by the Jeannette Glass Co. in the 1930's. It is in excellent condition. We have 2 of these available for $24.00 each. 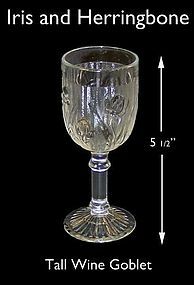 This 4 1/2 inch tall Iris wine goblet was made by The Jeannette Glass Co. in the 1930's and is in excellent condition! 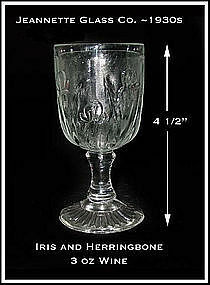 This 6 1/2" tall footed Iris and Herringbone ice tea glass was made by The Jeannette Glass Co. in the 1930's. It is in excellent condition, and guaranteed to be old. 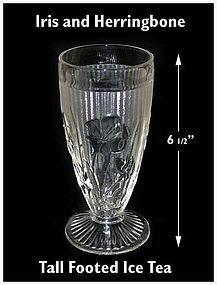 This is the rare tumbler with the Iris embossed on the foot part of the tumbler in addition to the pattern on the glass. These were only made in a very limited production! 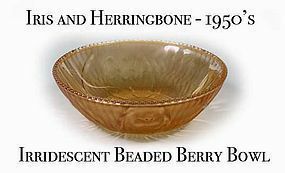 This Iris and Herringbone beaded berry bowl was made by The Jeannette Glass Co. in the 1950's. It is in excellent condition! There are 6 bowls available @ $10.00 each. These items sold in even numbers only. 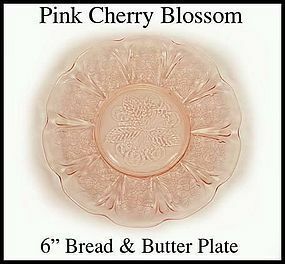 This pink Cherry Blossom 6" bread and butter plate is in excellent condition. It was made by the Jeannette Glass Co. in the 1930's. $17.50 each ~ SOLD! - Thank You! 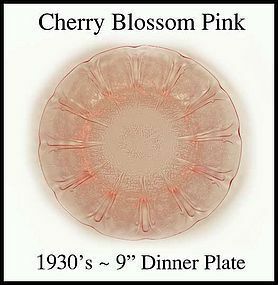 This pink Cherry Blossom 9" dinner plate is in excellent condition. It was made by the Jeannette Glass Co. in the 1930's. 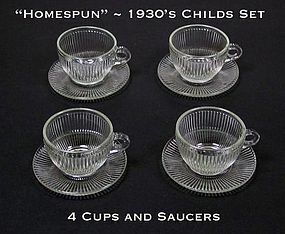 These crystal Homespun cups and saucers are part of a child's set made in the 1930's by The Jeannette Glass Co. There are very good quality, with no damage or flaws of any kind on this set. 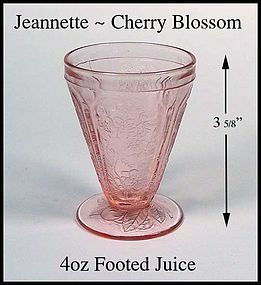 Vintage Jeannette Glass, 1930-1939. 3 5/8" tall old footed juice is 2 3/4" wide, and holds 4 ounces. Excellent condition! This is the nice soft pink color, not the orangish pink. There are 6 tumblers available @ $17.00 each. 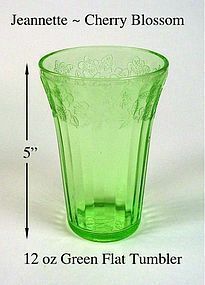 This 12 oz green Cherry Blossom flat ice tea glass is 5 inches tall, and in excellent condition! We have 3 of these mint tumblers available for $70.00 each. 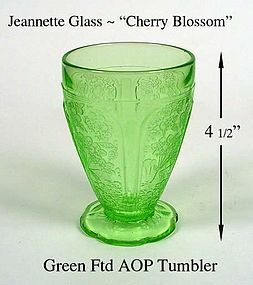 This green Cherry Blossom original footed all over pattern tumbler was made by the Jeannette Glass Co in the 1930's and is in excellent condition! The size is on the photo. They have the scalloped foot. 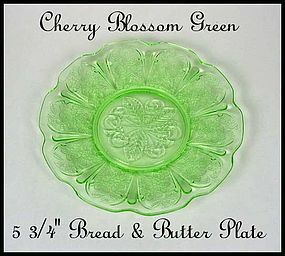 This green Cherry Blossom 5 3/4" bread and butter plate is in excellent. 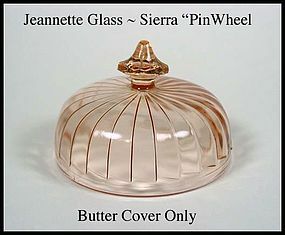 It was made by Jeannette Glass in the 1930's. 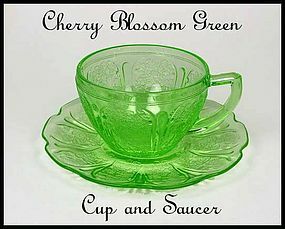 This green Cherry Blossom cup and saucer were made by The Jeannette Glass Co. in the 1930's, and is in excellent condition! 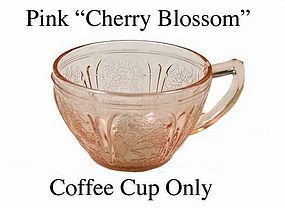 This pink Cherry Blossom cup is in excellent condition! This is a cup only, with no saucer. 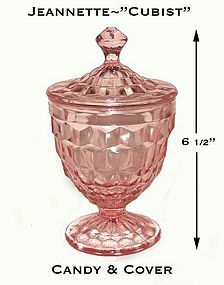 This footed pink Cubist covered candy is in excellent condition and was made by Jeannette Glass in the 1930's.